Should Writers Take More Risks? This immediately made me consider how writers measures success. Is it sales? Is it in the creative process itself? Is it in affect the lives of others? Clearly, each writer will have their own combination of these and many other measures, but it begs the question of whether becoming “an Amazon bestseller!” is the end goal of publishing. And I do see many writers and creative people RUSHING AROUND trying to figure out the quickest path to “success.” They obsess over what is working today – they want to know the “best practices” that make false-promises of shortcuts to an audience, to a platform. Oftentimes, the biggest headlines of what works really describe what worked 18 months ago for a handful of people, and is now no longer all that unique. We seek what is known because it is safe. We justify it as being “proven,” but the fact of the matter is that success is a process of many tiny failures that add up to the more than the sum of their parts. I tend to view writers as entrepreneurs. There is so much risk involved emotionally, in the return on investment of their time, and in any efforts they make in the publishing process. Even a moment ago, I read a quote from Steven Spielberg that his Oscar winning film Lincoln was “this close” to being a TV movie on HBO, never landing in theaters. As a viewer, we see Lincoln as another great award winning Spielberg film. But from his perspective, he likely pushed past barriers and risks for years on that film, including it never even getting into theaters. The process was a core part of the art. I do feel that writers would be better served if they accepted a similar attitude in their work. That publishing is part of the process. That crafting a meaningful platform with readers is a part of the process. Should writers take even more risks? No. But they should accept the risks that they are taking inherently as writers, embrace them, and use them to expand their work in new ways. 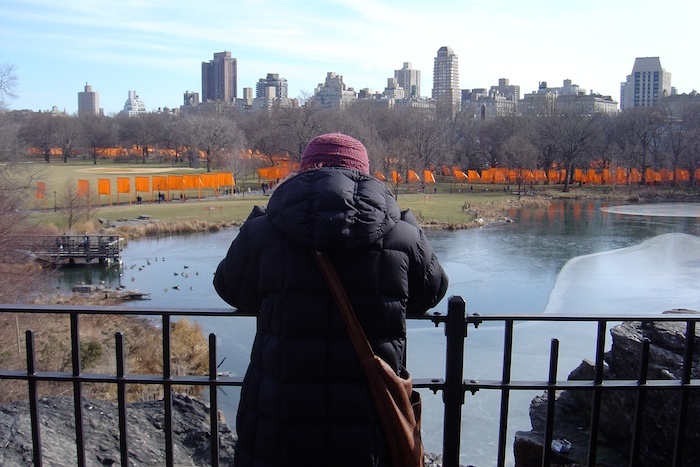 Here is my wife experiencing Christo and Jeanne-Claude’s “The Gates” in New York City in 2005. She is looking out on something totally unexpected, something many did not consider to be “art” when first proposed by the artists back in 1979. It took 25 years to turn their idea into reality. Should Christo and Jeanne-Claude have put oil paint on a rectangular canvas instead of crafting a wholly original process and works for art? As a write, as a creator, you get to decide that for yourself. Porter Anderson recently explored the pressure being put on writers to write more and write faster. Well work checking out.